What does Phoebe look like? 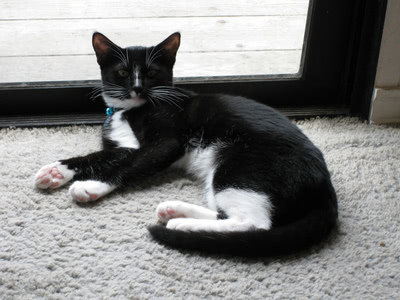 Phoebe is a tiny little black-and-white tuxedo cat. She is an itty bitty kitty with itty bitty paws and an itty bitty head and a tail that curls up over her back (instead of just going straight up and down). All her tiny little paws are white. She looks like she has tiny white gloves on her front paws, and white boots up her back legs. She has almost no white on her face, just a little jagged stripe down between her eyes and a lop-sided splotch by the side of her nose. But her whiskers are all white, radiating out from her black face like a star burst. It's very striking. 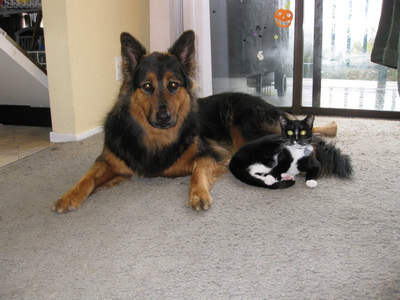 She has pale yellow-green eyes and short fur, rather coarse for a cat. Losing Kirby was very hard on us. It was a couple of years before I felt ready to try to find the next kitty for our family (that, and the lack of time/energy after baby). Somebody at my Rally class mentioned that the kennel where I take the puppers for boarding had a whole mess of kittens up for adoption. People kept bringing them in and asking them to find homes for them, and they couldn't say "no". They had at least two litters. Our daughter, who had just turned two, had always liked cats and had been asking for a kitten, so I thought it might be a good time. I decided to take the kiddo to see the kittens, and if there was one that I thought would fit into our home, we'd take one home. We got to the kennel, and they took us into a small room full of kittens and a couple adult cats. There were at least half a dozen or so. Many of them fled in terror as soon as we entered. "Uh, oh," I thought, "this is not a good sign." I didn't want a semi-feral cat I'd never see and would always be afraid would attack guests or the vet. But, a couple of the kittens were still out, so I decided we'd stay for a while and check them out. I sat down and kiddo started looking at all the kittens. We watched them for a while, and tried to play with them. I was mostly thinking of another male, so when a mostly white boy climbed in my lap and curled up for a nap, I thought he might be the one. 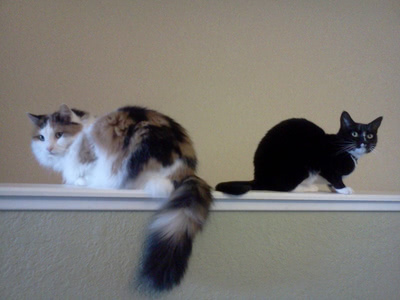 But, a little black and white female kitten was following the kiddo around so calmly and curiously. Kiddo had been watching me do nose work with Penny, and so had taken some of the kittens' kibbles and was dropping them into various boxes that were around the room for the kittens to play in. This little black and white kitten was following her around and hopping into every box she dropped a kibble in. The kitten was unafraid of the tiny human. It was very cute. 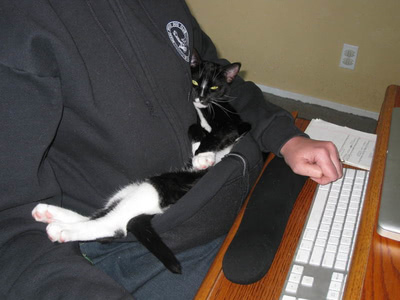 I was worried she might be too skittish, but then little black and white kitten came over and curled up on my lap too. I thought, she had to be the one. I liked the white male, but he was pretty indifferent to us in general, so we picked the black and white kitten. The staff told us they were calling her "Sheila". They said there was no adoption fee, because the kittens weren't spayed or neutered and we'd have to pay for that ourselves when she was old enough. We signed some paper work, put her in our carrier, and brought her home. I knew we would not be calling her "Sheila", so we set about trying to come up with a name for her. After a few rounds of back and forth, using kiddo's black and white kitty toys' and stuffed animals' names for inspiration, we finally settled on "Phoebe". Then we set up a "kitten habitat" in an x-pen in the living room, partially under a table and with flattened boxes to extend the roof. She had her litter box, food and water bowls, and an upside-down box with a door cut in to hide in. And hide she did, for the first day or two. Penny didn't help, as she laid down at the x-pen with her nose between the bars, licking and whining. Penny had to be banished from the living room until she could stop being obsessed. 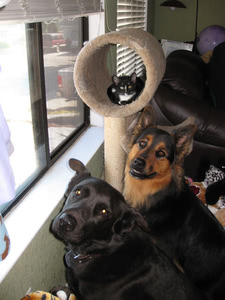 It didn't take Phoebe very long to settle in and get used to the dogs. 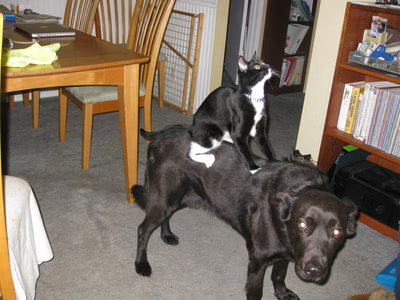 Within a week she was making excursions out of her kitten habitat, and both dogs were behaving themselves. 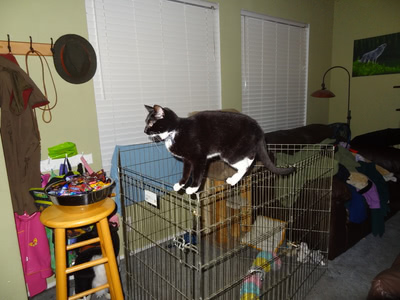 She started showing us her crazy balancing abilities, and after a few weeks of being in the kitten habitat, her escape artist tendencies. I wanted her to stay in the kitten habitat at night for a while longer, just to make sure she could find the litter box and didn't get into mischief by herself or with the dogs while we were sleeping, but she had other ideas. First, she would meow - loudly. 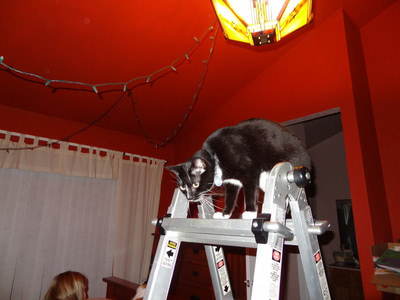 Then she would climb up the x-pen like a ladder. Somehow, she managed to push her way past the cardboard roof and she was out. So we started to transition her out of her habitat. Of course, Phoebe being free at night meant she did get into mischief. Phoebe was the queen of mischief. No hair band or rubber band was safe from her. And she felt the need to share. In the middle of the night. On our bed. We quickly learned to make sure hair bands and rubber bands were kept out of kitten paw reach and safely in drawers. Although, that didn't always stop her. Once I found her with a rubber band, which I took away from her. Then I heard a loud scrabbling noise from in a cabinet and found her climbing into a drawer from the back to get at a baggie of rubber bands! More than once I found a hair band in the toilet, even though the lid was down. It took me a while to figure out she was playing with them on the porcelain behind the seat, and then batting them into the bowl from under the seat. Sigh. We'd had Phoebe for a few days when somebody pointed out something weird with her eye. We mentioned it at her next vet visit, and it turned out her iris had adhered to the inside of her cornea. It looked super weird. We found out that when she had first come to the kennel, she had an eye injury, which they had gotten treated. They weren't even sure she would have sight in that eye at first, but she just ended up with that adhesion. After a few months of growing, it seemed that the adhesion just broke, and now she just has normal eyes. All that's left now is a small dot on her cornea where the iris had been adhered. What's Phoebe like at home? 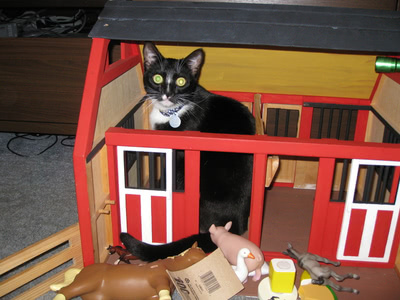 For her first three or so years, Phoebe was a super naughty kitty. Constantly getting into trouble. But, now that she's a bit older, she seems to have mellowed out a bit. She doesn't get into trouble much (or, at least, she doesn't get caught) unless somebody forgets to put away a hair band. She still finds those completely irresistible. And I think she's stolen my bacon off the counter a few times when I've been outside with the pups. But she's definitely less mischievous than she used to be. Mr. Pawter might have something to do with that. Phoebe has also gotten more and more snuggly as she's gotten older. She has never liked to be petted. She will do a limbo under your hand if you try to stroke her back the vast majority of the time. But she does have a couple times a day when she goes into super snorgle mode, purring and rubbing and actually enjoying being petted. At these times she likes to climb up on your shoulders and lean into your head, purring all the while, walking back and forth from shoulder to shoulder. It's really cute, but she can be quite insistent about it, which makes it hard to get her to stop (and it's really not good when you are trying to take out your contacts). She also likes to be held firmly in your arms, like Temple Grandin's squeeze machines. She will contentedly stay there, purring, as you hold her gently but firmly (but no petting - that's still off limits). When she's not in her super snorgly mode (which is most of the time), she likes to be near us, but not on us, unless it's really cold. She sleeps on the bed at night, but down near our feet and definitely not on us. She hangs out while we watch TV, but on the back of the sofa near our heads. And if you do start to pet her, she will almost certainly leave. She can also be a rather twitchy kitty. Sometimes if you make a sudden movement with your phone or something she will jump back three feet, quite dramatically. Does Phoebe have any aliases? Phoebe was the naughtiest kitten we have ever had, by far. For her first three or so years, she was constantly getting into mischief. Jumping on the kitchen counters, messing with things in the sink, getting into the green waste or trash, stealing hair bands (and then finding a way to drop them in the toilet), climbing into cabinets and then up into drawers to get to rubber bands - you get the idea. For this reason, she earned the nickname of "Naughty Kitten", which has subsequently been shortened to "Nitten". She also goes by Nitty, Naughty-no-nitten, Phoebe Nitten, Nitty Bitty, Nutter Butter, Nitty Nut Butter, and Nitty Nut. Phoebe is a pirate cat? Phoebe is the most agile cat we have ever had, by far. She is the only cat we have ever had that enjoys riding around on your shoulder. And that without any bribery. She has no qualms about jumping up you from the back to perch on your shoulder. Usually, you don't even know it's coming until she is clambering up your back. 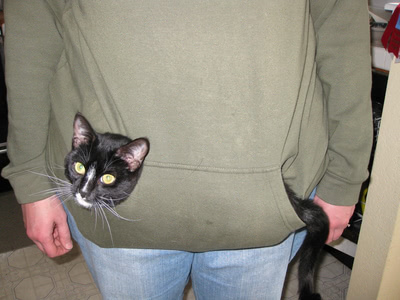 She'll sit on your shoulder as you walk around, much as a parrot traditionally perches on a pirate's shoulder. It's pretty cute. It doesn't hurt that she is also a tiny cat, so she fits pretty well. Phoebe is agile in other circumstances too. 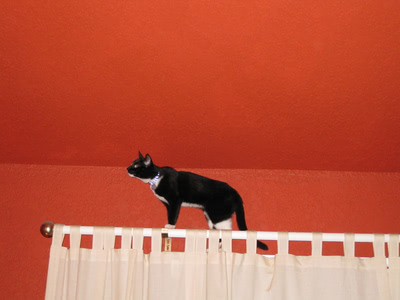 She has always had an easy time balancing on things like the skinny little backs of chairs or on top of a baby gate. She just hops up and lands there like it's nothing. 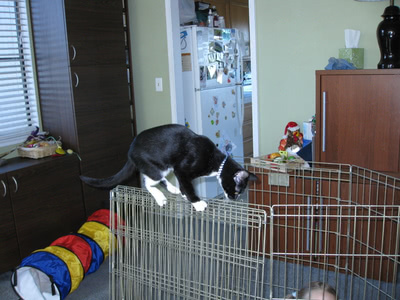 She also can jump lightly between many places, like up to high shelves in the closet and onto the entertainment center. Sometimes you don't even want her in those places, like on top of the refrigerator, where she knocks over all the medicine bottles when she jumps up there.